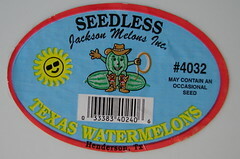 Click the picture for my fruit sticker slide show. Very cool. (By_steph's idea is kind of scary...) It would be funny if someone got a lot of stickers tattooed on themselves as if they were a refrigerator. How energy efficient will laser technology be. I´d rather see art than numbers anyday. Make a coffee table book! May contain an occasional seed is priceless.